Take, for example, cases of low air flow in your system. This is a situation where the air either fails to come out of one or more of your ducts, or comes out at a much slower rate than it should. While it doesn’t sound like much, in indicates a significant problem, and if you don’t take care of it, it could return to bite you when you least suspect it. Low air flow is a problem because it slows down your air conditioner’s ability to cool the home. 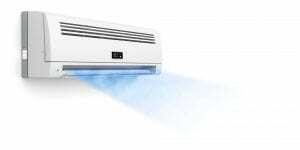 It will therefore need to work harder to do its job, raising the cost of running your air conditioner accordingly. In addition, it increases the strain on other components, hastening the possibility of a breakdown and a more serious repair call. Indeed, in some cases, low air flow already means that an important component isn’t working the way it should, and will need to be repaired as quickly as possible. There are a number of possible causes of low air flow in your system, which is one of the reasons why you need a professional service to diagnose it. Generally speaking, the causes of low air flow fall into one of two basic categories. Something is blocking or diverting the flow of air. This can mean a clogged filter, a crimp in the ducts, a breach somewhere in the system, or even something in the air conditioner itself preventing the air from moving. It’s problematic in part because it can cause the cool air to remain stuck in the AC, which can affect the performance of other, more important components. There’s a problem with the power source. This usually means trouble with the fan motor, such as a frayed electrical connection or other warn parts, though it can also mean problems with the fan belt or even the fan blades themselves. Never attempt to diagnose a problem with your air flow yourself, much less repair it. As indicated above, there are a number of possible causes of low air flow, and it takes training and experience to correctly spot the one affecting your system. Furthermore, air conditioners contain dangerous components like refrigerant, which requires proper licensing to handle safely. Instead of trying to correct the problem yourself, turn the system off – even if it’s a hot day – and call in a repair service immediately. For high quality air conditioning repair services in the Holladay, UT area, call the friendly pros of At Your Service Plumbing, Heating & Air today!